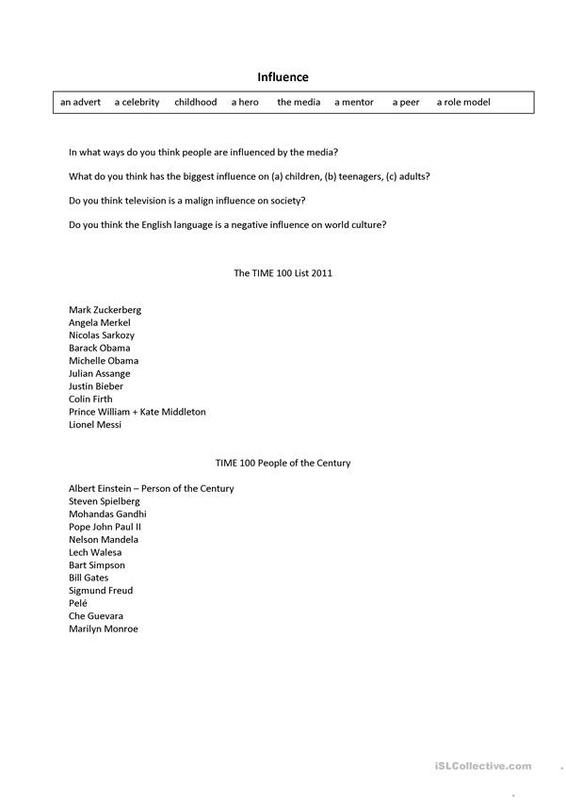 Uses a selection of people from TIME 100 Lists (2011/of the Century) as the basis for a dsicussion of what influences us (advertising? friends/family? the media?) in the modern world. Feedback welcome. The present printable, downloadable handout is intended for business/professional students and high school students at Upper-intermediate (B2), Advanced (C1) and Proficient (C2) level. It is a valuable material for honing your groups' Speaking skills. dancollis76 is from/lives in Poland and has been a member of iSLCollective since 2011-09-18 13:38:18. dancollis76 last logged in on 2011-09-18 13:38:18, and has shared 1 resources on iSLCollective so far.